The Mayor of Taunton Deane, Cllr Tim Slattery, combined business with pleasure when he launched a raffle in aid of Taunton Women’s Refuge. For the exquisite, hand-made quilt has been made by a group of friends who live in North Curry and Stoke St Gregory including the Mayoress, Gill Slattery. 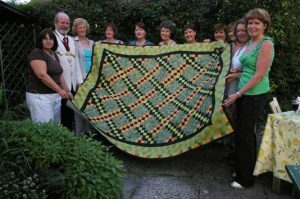 The women began meeting regularly to make each other friendship quilts nearly 20 years ago: since then they have made many quilts for themselves and their families, as well as two charity quilts. The double-bed size quilt, hand pieced and quilted using fine cottons, is made up of 72 blocks. Raffle tickets can be purchased from Bredons Sewing Machines Centre, Eastgate, Taunton, where the quilt will be displayed for several weeks during August. It will also be exhibited at North Curry Flower & Horticultural Show in the Village Hall on August 30 and at other local venues throughout the year. Taunton Women’s Refuge is a registered charity and offers a safe haven for women with or without children who have suffered domestic violence by someone with whom they have had an intimate relationship.